Should you peel parsnips just like you peel potatoes? We take a look at the peel vs no peel camps out there to help you make your decision. New York Times: To Peel or Not to Peel? Sometimes peeling vegetables is therapeutic, especially when I use my little ceramic peeler. Mostly, however, it’s a pain. Which is probably why I find myself doing less of it as time goes by. […] But a lot of peeling is just habit. We were brought up peeling potatoes and carrots so we peel potatoes and carrots. 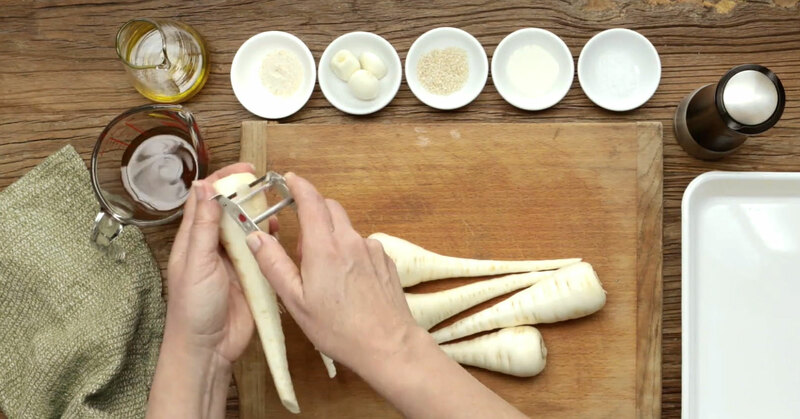 Young, small parsnips don’t really need peeling – just scrub clean and serve whole. 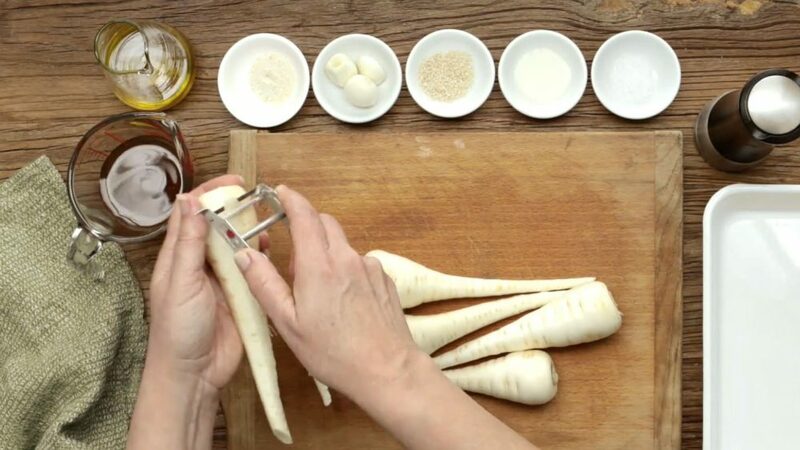 Older parsnips should be peeled very thinly with a peeler or sharp knife, then chopped into evenly sized chunks. If the central core is very fibrous, this should be cut away. Peeling isn’t really necessary for many fruits and veggies, and in fact, can contribute to the food waste problem, adding to landfills and compost bins. In our opinion, mini/young parsnips don’t need peeling, unless you really don’t want to scrub them, depending on the recipe you’re going for. If you’re making parsnip chips or parsnip hummus, peeling is part of the game. For many other things, it’d depend on the parsnip you have on hand. Remember, once you peel them, you’d have to cook them–or the parsnips will start to discolour. If you’re cooking with old, large parsnips, you should also discard any very fibrous centres that you find, as those might be bitter and unpleasant to eat. If you’re planning on peeling, don’t go overboard: trim the ends, then use a veggie peeler for the best results. If you’re composting the peels, you can chop them down so that they’d break down more quickly.